Love a good story? Then Take a Break's Fiction Feast is perfect for you. Full of gripping, spine chilling, tantalising tales as well as family stories that will warm your heart. 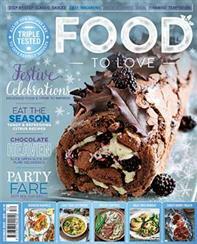 If you're a food lover or passionate for baking and cooking, then our Food to Love magazine is for you. Full of recipes, practical tips and useful techniques that you can easily carry on in your own home. If you're looking for a good all-rounder Yours magazine is the one for you - celebrating all aspect of life with health news, cooking recipes and puzzles. 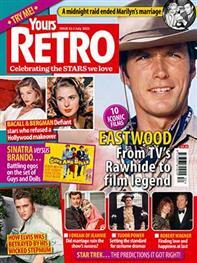 Yours also has a new nostalgic magazine - Yours Retro that celebrates the romance of the past through celebrity love stories, dramatic events and the nostalgia of everyday places and objects. Alongside celebrity features revealing the inner secrets, gossip and style tips of Britain's favourite stars, Bella offers a weekly fix of real life stories as well as classic features covering fashion, beauty, health and food and travel. 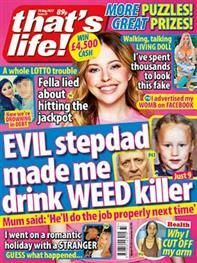 The UK’s top selling mag for all your psychic and spooky reads. 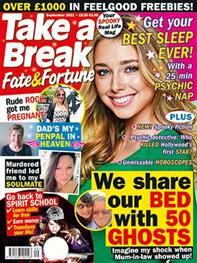 Take a Break's Fate & Fortune is a must-have mystic mag featuring spine-chilling true-life stories and horoscopes, plus advice from the UK's top mediums and psychics. 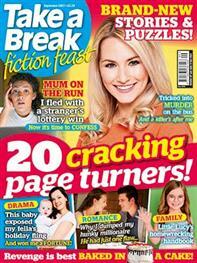 If you love a good story, then Take a Break's Fiction Feast magazine is ideal for you. Crammed full of easy to read, addictive stories of all genres and lengths, just find a quiet corner and relax with Fiction Feast every month. Food To Love magazine is all about how to bake, cook and make delicious food. Helpful tips and hints are provided to help readers cook with confidence! Having a magazine subscription ensures that you'll never miss an issue. 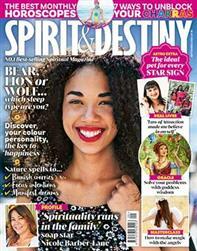 If you're a big astrology fan, then our Spirit & Destiny magazine may just be for you. Filled with magical features on feng shui, psychic matters, health & fitness as well as 7 pages of detailed monthly horoscopes to guide you through the month. 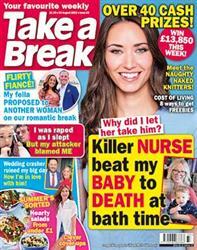 Take a Break's weekly digital magazine is packed full of compelling true-life stories, the latest health, fashion and beauty tips, plus cookery and travel. 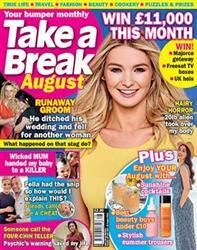 Take A Break is available in digital so you'll be able to access your favourite women's magazine instantly on your Apple or Android device! Take A Break Series is a monthly magazine made up of all the best bits of the nation's favourite weekly magazine - Take A Break. It's available in digital so you'll be able to access your favourite women's magazine instantly on your digital device. That's Life magazine is where you'll find the stories that no other magazine dares to tell. With it's perfect mix of humourous and captivating articles, it's a must-have for every household. That's Life is available in digital format so you can access via your digital device. 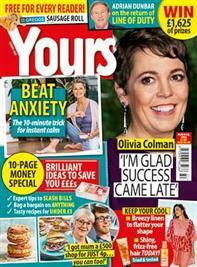 Yours magazine is a friendly community where every fortnight you can share stories and laughter. Discover the latest health and beauty tips, interviews + more. Yours is available as a print or digital magazine subscription or as a single issue. Yours Retro is a nostalgic treat that celebrates music, TV and film from the years gone by and rejoice in the everyday things we used to love. Yours Retro is available as a print magazine subscription or as a single issue.